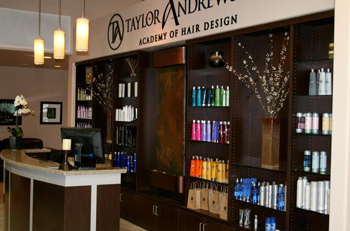 The Taylor Andrews Orem campus provides many opportunities for you to get a great start in the beauty industry. Many of our graduates have gone on to become world-class stylists, makeup artists, and estheticians, some working in high-end salons while others go on to start their own business and build their own clientele. Our beauty school in Orem is a fully-stocked, state-of-the-art facility contains the tools and resources you need to complete your coursework. You’ll also find experienced teachers who provide motivation and encouragement, supplemented by cutting-edge teaching tools and a high-end functioning salon so you can start to experience real-world situations all throughout your education. We are located near I-15, toward the south side of Orem, so if you’re looking for a beauty school near Provo, Lehi, American Fork, Pleasant Grove, and Spanish Fork, we’re just a short commute away. Our programs here include our full range of cosmetology courses, classes in makeup artistry, and a complete barbering program. Call us today to enroll and to learn more about the programs available at the Taylor Andrews beauty school in Utah County.